A simple dynamical density functional theory, the phase-field crystal (PFC) model, was used to describe homogeneous and heterogeneous crystal nucleation in two-dimensional (2D) monodisperse colloidal systems and crystal nucleation in highly compressed Fe liquid. External periodic potentials were used to approximate inert crystalline substrates in addressing heterogeneous nucleation. In agreement with experiments in 2D colloids, the PFC model predicts that in 2D supersaturated liquids, crystalline freezing starts with homogeneous crystal nucleation without the occurrence of the hexatic phase. At extreme supersaturations, crystal nucleation happens after the appearance of an amorphous precursor both in two and three dimensions. Contrary to expectations based on the classical nucleation theory, it is shown that corners are not necessarily favourable places for crystal nucleation. Finally, it is shown that by adding external potential terms to the free energy, the PFC theory can be used to model colloid patterning experiments. Herein we provide a brief summary of the background, events and results/outcome of the CECAM workshop Classical density functional theory methods in soft and hard matter held in Lausanne between October 21 and October 23 2009, which brought together two largely separately working communities, both of whom employ classical density functional techniques: the soft-matter community and the theoretical materials science community with interests in phase transformations and evolving microstructures in engineering materials. After outlining the motivation for the workshop, we first provide a brief overview of the articles submitted by the invited speakers for this special issue of Journal of Physics: Condensed Matter, followed by a collection of outstanding problems identified and discussed during the workshop. We use a simple density functional approach on a diffusional time scale, to address freezing to the body-centered cubic (bcc), hexagonal close-packed (hcp), and face-centered cubic (fcc) structures. We observe faceted equilibrium shapes and diffusion-controlled layerwise crystal growth consistent with two- dimensional nucleation. 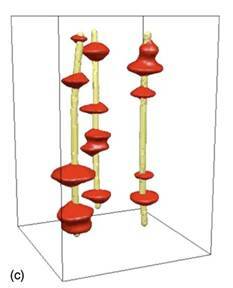 The predicted growth anisotropies are discussed in relation with results from experiment and atomistic simulations. 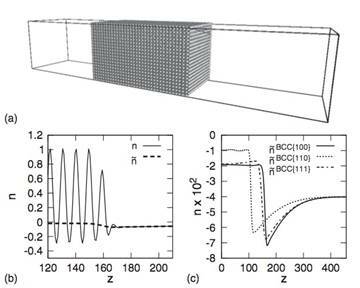 We also demonstrate that varying the lattice constant of a simple cubic substrate, one can tune the epitaxially growing body-centered tetragonal structure between bcc and fcc, and observe a Mullins-Sekerka/Asaro-Tiller-Grinfeld-type instability. The hard-sphere system is the best known fluid that crystallizes: the solid-liquid interfacial free energy, the equations of state, and the height of the nucleation barrier are known accurately, offering a unique possibility for a quantitative validation of nucleation theories. A recent significant downward revision of the interfacial free energy from 0.61kT/s^2 to 0.56 kT/s^2 [Davidchack, R.; Morris, J. R.; Laird, B. B. J. Chem. Phys. 125, 094710 (2006)] necessitates a re-evaluation of theoretical approaches to crystal nucleation. This has been carried out for the droplet model of the classical nucleation theory (CNT), the self-consistent classical theory (SCCT), a phenomenological diffuse interface theory (DIT), and single- and two-field variants of the phase field theory that rely on either the usual double-well and interpolation functions (PFT/S1 and PFT/S2, respectively) or on a Ginzburg-Landau expanded free energy that reflects the crystal symmetries (PFT/GL1 and PFT/GL2). 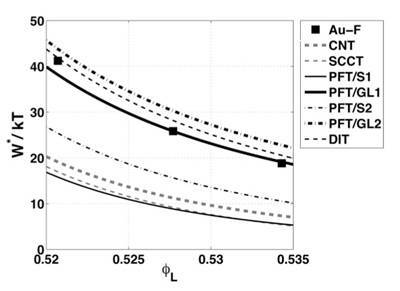 We find that the PFT/GL1, PFT/GL2, and DIT models predict fairly accurately the height of the nucleation barrier known from Monte Carlo simulations in the volume fraction range of 0.52 < f < 0.54, whereas the CNT, SCCT, PFT/S1, and PFT/S2 models underestimate it significantly. We extend the phase field model of heterogeneous crystal nucleation developed recently [L. Gránásy et al., Phys. Rev. Lett. 98, 035703 (2007)] to binary alloys. Three approaches are considered to incorporate foreign walls of tunable wetting properties into phase field simulations: a continuum realization of the classical spherical cap model (called model A herein), a nonclassical approach (model B) that leads to ordering of the liquid at the wall and to the appearance of a surface spinodal, and a nonclassical model (model C) that allows for the appearance of local states at the wall that are accessible in the bulk phases only via thermal fluctuations. We illustrate the potential of the presented phase field methods for describing complex polycrystalline solidification morphologies including the shish-kebab structure, columnar to equiaxed transition, and front-particle interaction in binary alloys. We present an efficient method to solve numerically the equations of dissipative dynamics of the binary phase-field crystal model proposed by Elder et al. [K.R. Elder, M. Katakowski, M. Haataja, M. Grant, Phys. Rev. B 75, 064107 (2007)] characterized by variable coefficients. Using the operator splitting method, the problem has been decomposed into sub-problems that can be solved more efficiently. A combination of non-trivial splitting with spectral semi-implicit solution leads to sets of algebraic equations of diagonal matrix form. Extensive testing of the method has been carried out to find the optimum balance among errors associated with time integration, spatial discretization, and splitting. We show that our method speeds up the computations by orders of magnitude relative to the conventional explicit finite difference scheme, while the costs of the pointwise implicit solution per timestep remains low. Also we show that due to its numerical dissipation, finite differencing can not compete with spectral differencing in terms of accuracy. In addition, we demonstrate that our method can efficiently be parallelized for distributed memory systems, where an excellent scalability with the number of CPUs is observed. Advanced phase-field techniques have been applied to address various aspects of polycrystalline solidification including different modes of crystal nucleation. The height of the nucleation barrier has been determined by solving the appropriate Euler-Lagrange equations. 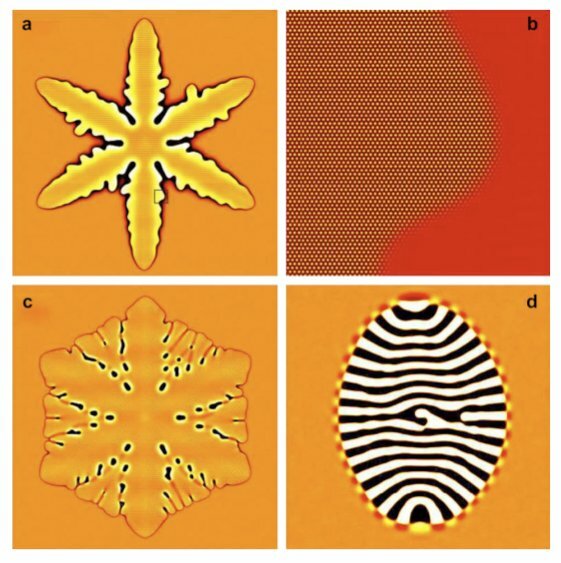 The examples shown include the comparison of various models of homogeneous crystal nucleation with atomistic simulations for the single-component hard sphere fluid. Extending previous work for pure systems [Gránásy et al., Phys. Rev. Lett. 98, 035703 (2007)], heterogeneous nucleation in unary and binary systems is described via introducing boundary conditions that realize the desired contact angle. A quaternion representation of crystallographic orientation of the individual particles [outlined in Pusztai et al., Europhys. Lett. 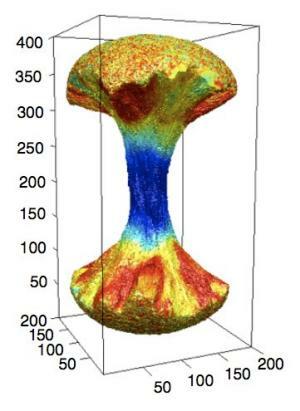 71, 131 (2005)] has been applied for modeling a broad variety of polycrystalline structures including crystal sheaves, spherulites and those built of crystals with dendritic, cubic, rhombo-dodecahedral and truncated octahedral growth morphologies. Finally, we present illustrative results for dendritic polycrystalline solidification obtained using an atomistic phase-feld model. The phase field theory PFT has been applied to predict equilibrium interfacial properties and nucleation barrier in the binary eutectic system AgCu using double well and interpolation functions deduced from a Ginzburg-Landau expansion that considers fcc face centered cubic crystal symmetries. The temperature and composition dependent free energies of the liquid and solid phases are taken from Calculation of Phase Diagrams-type calculations. The model parameters of PFT are fixed so as to recover an interface thickness of 1 nm from molecular dynamics simulations and the interfacial free energies from the experimental dihedral angles available for the pure components. A nontrivial temperature and composition dependence for the equilibrium interfacial free energy is observed. Mapping the possible nucleation pathways, we find that the Ag and Cu rich critical fluctuations compete against each other in the neighborhood of the eutectic composition. The Tolman length is positive and shows a maximum as a function of undercooling. The PFT predictions for the critical undercooling are found to be consistent with experimental results. These results support the view that heterogeneous nucleation took place in the undercooling experiments available at present. We also present calculations using the classical droplet model classical nucleation theory CNT and a phenomenological diffuse interface theory DIT. While the predictions of the CNT with a purely entropic interfacial free energy underestimate the critical undercooling, the DIT results appear to be in a reasonable agreement with the PFT predictions.